These notes are for additional troubleshooting and should be used with the Isotemp Owners Manuals. Please read the manual for your water heater so you understand how it works. Download the manual for your tank. They can be helpful! IMPORTANT !!!! Make sure the water heater is disconnected from the power supply before making any tests. Check the Overheat Thermostat under the grey cover on the tank. A small plastic pole will pop up if the overheat sensor is tripped from the tank running dry or overheating. Push down to reset. Check the resistance of the element. The heating element can be tested using an OHM meter. A good 115VAC heating element will measure approx. 20 OHMS (230V element is approx. 50). A bad element will be either open - infinite OHMs- or short - 0 OHMS. Most often when the element fails it will fail open. Check back to overheat and temperature thermostats. If there is a thermostat failure, replace thermostat. Water supply from engine may be blocked. Check for kinks or remove hoses and blow air or run water through to clear the hoses. If the water heater is mounted above the engine water ports, an air bubble may be blocking water flow. Only a small portion of water that cools the engine is diverted to auxiliary devices like a water heater, so this may not be enough to push an air bubble through the pipes. Create an artificial ‘trap’ (high point)above the engine and water heater on one of the hoses. Install a bleeder valve to bleed off trapped air. Fittings - Isotemp tanks now use a 1/2” Pipe Thread that is compatible with US standard 1/2” NTP Tapered and will mate with the typical plumbing adapters available at most hardware stores and chandlers. Tapered fittings get tighter and seal as they are threaded together. This is what we normally expect to see. 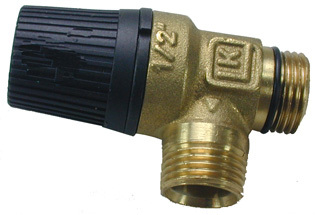 The threads on older style tanks and the threads on the mixing valves and pressure relief valves are BSP ( British Standard Pipe) with Parallel (Not tapered threads) BSP fittings do not seal as they are threaded together and require a sealant such as Locktite 242 or 248 to make a leak free connection. This style requires a TEE fiting - the black cap is rotated to open the drain. The relief valve will open when the pressure exceeds a pre set valve. 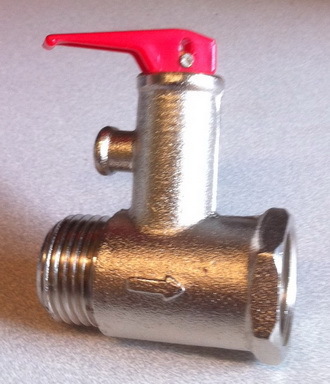 If the valve is opening when it is not expected to it may have failed and need to be replaced. Always check the water system pressure before replacing the valve. It is surprizing how often a water pump pressure regulator will fail or drift up to a higher setting.